By default, Word 2016 and 365 automatically create hyperlinks out of web addresses you type. If you’d rather Word not create hyperlinks automatically, you can disable this functionality. Here’s how. Sometimes you just want to type a URL in your document and not have Word create hyperlinks for it automatically. This is especially true in areas like bibliographies where having every line contain blue, underlined text can be pretty distracting. Sure, you can go through and remove those hyperlinks manually, but you can also keep word from creating them in the first place. You can always go in and insert hyperlinks yourself where you want them. To turn off automatic hyperlinking, switch over to the “File” menu. In the Word Options window that appears, on the left side, switch to the “Proofing” category. On the right side, look for the “AutoCorrect Options” section and click the “AutoCorrect Options” button there. 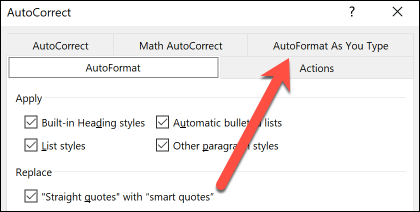 In the AutoCorrect window that opens, switch to the “AutoFormat As You Type” tab. In the “Replace As You Type” section, disable the “Internet and network paths with hyperlinks” option. Click “OK” to close the AutoCorrect window. 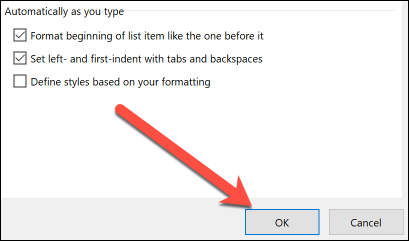 Click “OK” again to close the Word Options window and save your settings. Now, Word will no longer automatically create hyperlinks for you as you type or paste web addresses.